Why Is the IOC Punishing Iraq? 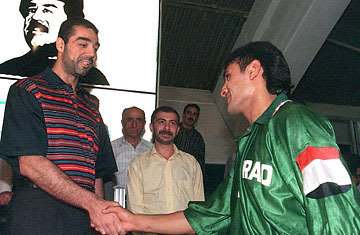 Uday Hussein, the eldest son of Iraqi President Saddam Hussein, greets an Iraqi player after the end of a soccer game. Hussein would often beat Iraqi athletes who did not perform to his expectations. A few days after the fall of Saddam Hussein, I got a chilling insight into the brutality of his rule, in the most unexpected place  the compound of the Iraqi sports ministry. In one corner of a sprawling complex of offices and official residences, behind walls emblazoned with the universal symbol of the Olympic Games, was that most medieval of torture devices: an iron maiden. It was nearly eight feet tall and looked like a cast-iron coffin. At first, I thought it was somebody's grotesque idea of a joke  a gag gift, perhaps, for Uday Hussein, Saddam's psychopath son and head of Iraqi's sports administration. But when I opened it, I realized its purpose was deadly serious. There were dozens of sharp spikes, all pointing inward. They were designed to perforate skin and flesh of anybody locked inside, but not deep enough to puncture any vital organs. That way, the torturers could inflict maximum pain on their victim without actually killing him. The spikes still bore the distinctive reddish-brown flakes of dried blood. The iron maiden confirmed some of the ghastly stories I'd heard about Uday's treatment of Iraqi sportsmen, especially the national soccer team. When they lost a game, they routinely received beatings and an imaginative range of punishments  like being made to kick concrete balls, or forced to run shoeless over shards of glass. Later, I would meet a coach who had spent two terrifying hours in the iron maiden  his torso was riddled with scars from the spikes. Needless to say, torture didn't make the Iraqi soccer team play better. But once freed from Uday's depravity, the team flourished. At the Athens Olympics in 2004, they went all the way to the semi-finals, losing the bronze medal game by a single goal to the mighty Italians. They had been the Cinderella team of the Games, and like their proud countrymen, I celebrated the team's success. Three years later, as their country was being torn apart by a bloody sectarian war between Shi'ites and Sunnis, the team (comprising of players from both sects) won the Asia Cup, leading to incredible scenes of jubilation on Baghdad's streets. The ghost of Uday Hussein and memories of his torture devices seemed to have been well and truly exorcized. But more recently, as the team's form has dipped, some painful memories have returned. Iraqi sports officials no longer torture players for poor results, but they seem to have inherited Uday's penchant for dishing out summary, collective punishment. Last month, when the team failed to qualify for the Beijing Olympics, the Iraqi Football Federation disbanded the entire squad  players, coaches and support staff. Now it turns out that even if the team had qualified, they might not have gone to Beijing anyway  because the International Olympic Committee has banned Iraq from the Games. The reason: in May, the Iraqi government disbanded the country's Olympics Committee and replaced it with new appointees. The government said the old committee has failed to hold proper organizational elections, but many in Baghdad suspect a sectarian motive. They point out that the sports minister is a a Shi'ite, whereas the country's sports administration had traditionally been in Sunni hands. The IOC, deeming this as political interference in sporting matters, gave the Iraqi government a deadline in which to reinstate the old committee. Baghdad refused to back down, and now the seven Iraqis who had qualified for the Games  two rowers, an archer, a discus thrower, a sprinter, a weightlifter and a judoka  have been told to unpack their bags. They're not the only ones suffering the consequences of political wrangling, though. The ban amounts to collective punishment for all Iraqis. The IOC's protestations that it had no choice but to impose its rules are plainly disingenuous. For one thing, Iraq is hardly the only country where politicians meddle with sport. The Games are, after all, being held in China! For another, if the IOC was perfectly happy to let Iraq participate in previous Games when Uday was running Iraq sports. Perhaps locking a football player in an iron maiden doesn't qualify under the IOC's definition of "political interference," but that's a distinction that will be lost on most Iraqis.